I met up with my mum and a friend of hers recently, who I hadn't seen for a long time, and she came along laden with gifts galore. 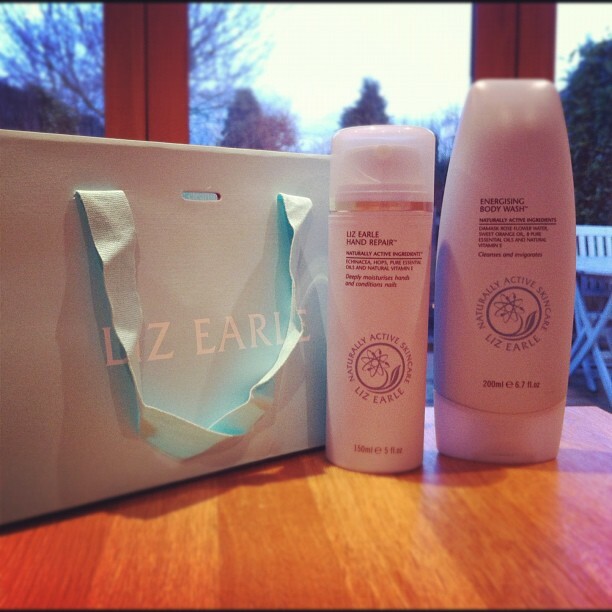 From Liz Earle. Lovely. I was intrigued to try them, as I've only tried three other products from the range so far: the much-lauded Cleanse & Polish, Botanical Shine Shampoo and the Sheer Skin Tint - the latter being the brand's first foray into make-up, with more make-up products to follow, all in good time. All three of these products were impressive, and at a good price too. The Hand Repair is good - it's in a pump dispenser which I like, and contains anti-oxidants to prevent ageing, and Vitamin E to nourish, plus echinacea and beat-carotene. If you like your hand creams light and non-greasy then this will be perfect for you - and others obviously agree as this hand cream has already won two industry awards. If you like a heavier, more emollient hand cream, then you might find this one a bit light. The Energising Body Wash is a pleasantly scented, kind on the skin shower gel, particularly good for those with eczema - one of the drivers behind Liz Earle launching this range, was her quest to find natural products which didn't aggravate her own eczema. The scent is from pure essential oils, including Sweet Damask Rose, and is a fresh, invigorating, stimulating fragrance which is a perfect morning pick-me-up. If you re-act to chemical foaming agents, then this is a great option, as the foaming agents are from corn and coconut - completely natural options. And rumour has it that Liz Earle's Superskin Concentrate is a real winner - that's next on my hit list. And when you order from their website, the products arrive beautifully packaged, and with samples galore. A nice touch.